Show me your turquoise and I will tell what your colour model is! It seems like a futile endeavour to try to define a colour. Colour actually does not exist. What we call colour, is a perceptual property derived from the spectrum of light interacting with the light receptors of the spectator’s eye. My colour perception varies probably a bit from yours and my sensitivity to colour is also likely to be slightly different from yours. However, in an effort to create some classification, colours may be defined and quantified by the degree to which they stimulate the receptor cells and can be further organised in a colour model to provide more or less reproducible representations. The inherent problem of colour being a perceptual property combined with technical constraints is reflected in the existence of many different colour models, each with their own usages. RGB and CMYK are the two most common ones. 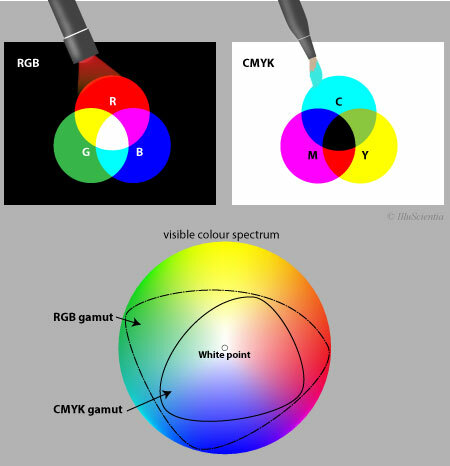 RGB versus CMYK colour model and their respective gamuts (range of colours that can be represented by each model). The visible colour spectrum representations in the image is skewed as it is represented with RGB colours. The gamut limits are approximative. RGB colour model is a colour model used in the digital world and stems from the three primary colours: red, green and blue. It is an additive colour model in which the three primary light colours add up in various proportions to reproduce a broad range of colours. Think of this model as painting with light: you start with a black background and by shining colour light onto it, you can create different colours. The more colour light you add, the brighter your colours get as you get closer to white. On your computer screen, this is achieved by regulating the intensity of red, green or blue light of each individual pixel. RGB has quite a large colour gamut (gamut is the range of colours that a colour model can represent) and allows for vibrant and saturated colours. RGB is device dependent and the colour rendering varies from device to device, manufacturer to manufacturer, or even in the same device over time. CMYK colour model originates from the printing press world and works with four primaries cyan, magenta, yellow, and black (K stands for “key”, “key plate” which in printing press carried the black ink). It is a subtractive colour model and hence, in a sense, an opposite of RGB: white is the natural colour of the paper to start with, while black results from a mixture of coloured pigments. As soon as you use colour ink on paper, the pigment absorbs part of the light spectrum which is subtracted from your background and you create a darker outcome. CMYK has a relatively small gamut compared to RGB and hence CMYK colours tend to appear onscreen a bit dull and lifeless. Bright and vibrant colours are difficult to achieve with CMYK. Also, as CMYK refers to physical printing on paper, even with the same CMYK colours the printed image is likely to look different depending on the type of paper it is printed on and its finishing (for example matte versus glossy). if you are planning to use the image as a publication figure, refer to your journal guidelines beforehand and follow their requirements. Therefore, for presentation slides, always use RGB. For posters, conference flyers or leaflets, go for CMYK. In case of scientific figures, the primary destination has shifted in recent days from printing to onscreen rendering as most publications are published online in advance. So CMYK or RGB? For traditional reasons, many scientific journals still specifically ask for CMYK figures. If that is the case with your chosen journal, favour working in this model. At the same time RGB images are also increasingly accepted by scientific journals. If your journal is one of them, by all means, work in RGB. Be aware that some (open source) graphic tools offer by default only one colour model to work with, for example GIMP creates RGB images only. An extension called Separate+ for GIMP offers some colour management features including RGB to CMYK conversion. However, colour model conversion from RGB to CMYK is not straightforward even if sometimes necessary. To be done correctly, it requires so called colour profiles to be included in the internal information of your image (ICC profiles). Nevertheless, even if your image is tagged with a colour profile, there is no one way of converting one colour model into another. As CMYK has a way more restricted colour gamut than RGB, the conversion outcome is usually approximative and sometimes requires manual tweaking afterwards to get closer to the look in RGB. Professional graphic software tools like Adobe Photoshop offer usually several options for converting image colour modes depending on what exactly you want to achieve. If you have no access to Adobe, online converters exist and can do the conversion for you. In any case, if you must convert RGB to CMYK, be careful and check if no data or detail loss occurred. Some colours like very saturated cyans and blues can become almost indistinguishable when converted to CMYK. Bear in mind that each colour conversion or transformation also decreases the final image quality. The bottom line being, the conversion is feasible but if you can avoid it by planning ahead, do so. One last thing: if you like to print your images but your prints sometimes turn out rather dark and washed out, the wrong colour model can be the culprit. In that case, it can be a good idea to experiment with RGB to CMYK conversion and even to invest time into calibrating your screen as well as working with a professional printer service. Alternatively find a printer service that can actually print RGB! It will pay off with more vibrant prints. RGB vs CMYK: good article on the topic from Biophysical journal. This post is partially based on this article. Wikipedia pages on RGB, CMYK and colour theory. If you like the content of this blog, sign up to receive the latest posts on graphic design for scientists directly to your inbox! Join 2k+ other scientists, researchers and communicators, and download free PDF "Graphic Design for Scientists and Researchers - 2017 edition"